Albertans were shocked by the election of Donald Trump as President of the United States, and at the misogyny and xenophobia that propelled him to the White House and has taken hold in his administration. 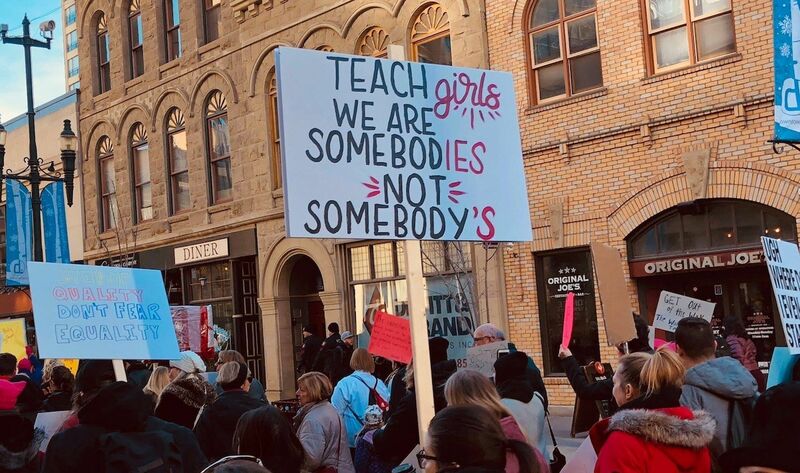 Thousands have marched at annual Women's Marches held across Alberta since 2017. Many are disgusted with the Trump administration’s treatment of Muslim and Mexican migrants, and its affiliation with transphobic, white supremacist, and anti-abortion groups that Trump appears to personally condone. The same intolerant views loom large in the current Alberta election. What happened in Charlottesville wasn’t an isolated act, but is the consequence of allowing hate to flourish. They don’t consider the views expressed by UCP candidates and members to be in the same vein as what is happening in the United States. Certainly, Kenney is not proposing to criminalize transgender people for using washrooms or lock up child migrants, but the same foundational views that spurred these incidents have been on display within the UCP. An extreme anti-abortion group has boasted that through a coordinated campaign, it has managed to nominate a number of UCP candidates with the aim of ensuring that Alberta has as many pro-life legislators as possible. Over successive weekends, white supremacists have marched on Whyte Avenue in Edmonton, claiming their right to our streets. And while it’s true that we haven’t had a Charlottesville incident in Alberta, what happened in Charlottesville wasn’t an isolated act, but is the consequence of allowing hate to flourish. There should be no acceptance of intolerance. This is the standard that should apply to any credible political party or politician in this province. Most people I know who have concerns over the UCP’s approach to social issues, but still intend to vote for them, are doing so due to concerns over the economy. It’s a concern that I understand. I own a small business. Many of my clients are individuals and small businesses who are struggling financially, in some cases having their homes foreclosed on or going through the insolvency process. But this election isn’t a choice between relieving economic anxieties or ensuring Alberta remains a place for everyone. Economic prosperity and social inclusion go hand in hand, and anyone claiming that one precedes the other is being disingenuous. Allowing LGBTQ2+ students safe spaces in schools doesn’t impact our ability to build interprovincial pipelines. Albertans are entitled to both financial security and recognition that they belong here, regardless of what they look like or whom they love. The United States made a similar bargain in electing Trump. That, in order to make America great again, some Americans would have to be sidelined. That race, gender, and sexuality matter in determining whether the American dream remains a dream or becomes reality. Elections serve many functions. They allow citizens to set the policy course of future governments, but are also referendums on who we aspire to be as a society, what values we cherish, and the type of community we want to build for ourselves and future generations. Trump’s America is not an aberration or a dystopian anomaly that could never happen in Alberta. It’s what happens when reasonable people choose to overlook what their politicians stand for, and with whom. It's what happens when reasonable people ignore the intolerance political actors direct towards their neighbours and loved ones. It's what happens when reasonable people forget that we all deserve to call this province home. Avnish Nanda is an Alberta-based public law litigator who teaches constitutional law at the University of Alberta's Faculty of Law.